Use the newsletter link above to join the mailing list so you can stay up to date with all that's happening. Wake up, take in an early presentation, then hit the road to ride the twisties that only the Gorge can dish out. Grab a bite along the way and return to the fairgrounds for an evening of camaraderie with other like-minded sport bike enthusiasts. Do it all again the next day! Go for high adventure as you ascend a peak, ride back down an alluvial fan and follow a ridge-line back to your home base at the Hood River Fairgrounds. Bike a little muddy? No problem, take advantage of our on-site bike wash, then settle in for an evening of fun entertainment with friends new and old as you bask in between two majestic Cascade peaks. Awesome roads and stunning scenery kick-off the ultimate sport touring getaway. There’s no shortage of either here. 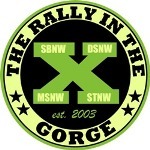 Couple them with a world-class rally facility and setting that’s not too big, not too small, and you’ll know you’ve found your sport-touring mecca at the Rally in the Gorge. Experience some of the best riding in North America today. The Columbia River Gorge National Scenic Area with its diverse topography features hundreds of miles of paved roads away from the main highways that weave their way between lush green forests, basalt uprisings and meandering river valleys. For dual sport adventure types, the area is a rider's playground featuring a wide array of dirt and gravel roads, two track and single track. For those interested in meshing some local history and insight into their adventure, the Columbia River Gorge features more than a half dozen museums and exhibits specific to the area. Learn about the unique geology of the area in the morning and take in a world class attraction in the afternoon. The choices are many. 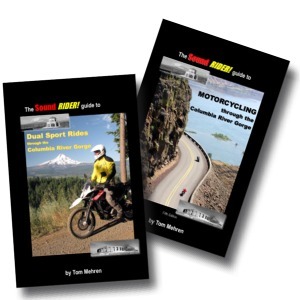 The Rally in the Gorge boasts a number of seminars, clinics and presentations designed to enlighten and enrich your two-wheeled passion. Scheduled events at the rally site as well as on-road clinics are available each day throughout the rally at your option. Use our suggested routes and down-loadable GPS files (available when you arrive) to take you off the beaten path, or create your own journey. While we offer our own suggestions and ride events each day, where you choose to ride during your time at the rally is entirely up to you. Settle in, kick back and enjoy some downtime at our rally site, nestled between two majestic volcanoes (Mt. Adams and Mt Hood). For those overnighting with us each night, you’ll find plenty of space for camping or RVing at a well-maintained event site that features on-site food options, hot showers, flush toilets, a bike wash and more. Rallies are a great way to meet people, and we’ve made sure to include several chances to mingle with others and mix in with like-minded riders. Over the years many friendships have ignited between rally goers, and they continue on year after year with each rider's return. Enjoy food provided onsite during the rally, nosh at a recommended local eatery, or pick up a sandwich to take away for the day and enjoy a picnic along the way. The Columbia River Gorge is chock full of endless food options wherever your route plans take you each day. Photo: Salmon from Goldendale's delicious Glass Onion restaurant. Our available routes provide more than 1,000 miles of pavement rides off the beaten track and more than 700 miles of dual sport routes. Simply put, you can't do it all in one rally. Which is why so many attendees come back again and again!